Sindhri is a leading mango variety from the Sindh province of Pakistan. For some Sindh is Sindh because of this Mango. Just the thought of the mango can transport a person to the idyllic shade of the mango tree, basking in the summer sun waiting for the next ripe mango to fall down. 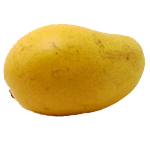 It is one of the most fragrant and flavorful mangoes grown in this region and one of our most popular varieties. It can grow very big in size towards the end of the season and has excellent shelf life. Some of the best Sindhri mangoes come from Mirpur Khas in the Sindh province of Pakistan. This fruit has excellent color and is extremely fiberless and delicate when ripe. Sindhri is also grown in the Rahim Yar Khan and Multan regions of Pakistan. As we move North, the Sindhri becomes sweeter at the expense of some of its flavor. The fruit is available in Sindh as early as May and in Multan as late as July.